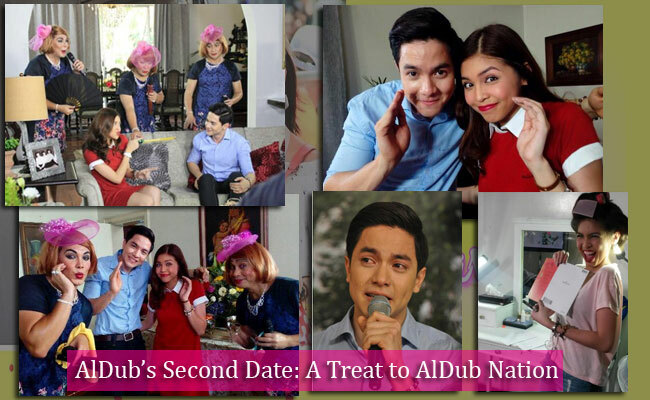 With AlDub’s first date that was unexpectedly cut short, Eat Bulaga gave the AlDub fans a wonderful treat to the split screen couple’s second date. For the first time, Lola Nidora had invited Alden Richards to their family mansion and have lunch with the family. Even before Alden got into the mansion, he had to fulfill several wishes of Lola Nidora. He sung ‘God Gave me You,’ the song he frequently dub smashes in every episode of Kalyaserye that became one of the fans’ favorite. As he song the song, the young actor could not stop the tears that started to well up in his eyes. He shared that he had always thanked the AlDub fans, but the sing was especially for ‘Meng,’ Maine Mendoza’s nickname. Fans teared up with him as his voice could not his his emotions. He also brought ‘chicharon’ for Lola Nidora that was given by actress Helen Gamboa. Alden did not also forget two bouquets of flowers as he goes to the De Explorer Mansion where he was met by Lola Tinidora played by Jose Manalo and Lola Tidora who was portrayed by Paolo Ballesteros. As soon as he set eyes on Yaya Dub, Alden could not hide his smile. Yaya Dub on the other hand could not look straight at him. As part of the condition, the two should maintain at least a foot apart from each other. The three grandmothers were always there to remind them of this condition, however, Lola Tinidora was so playful she would frequently push Alden towards Yaya Dub. Before they eat their lunch, they played trip to Jerusalem so Alden could sit the nearest to Yaya Dub. With a few moments that they were left alone, the two were able to talk with each other. Allan K pointed out that the two already forgot their Dub smash and just talked with each other, which was out of the character they are portraying. Inalay ni Bae Alden ang pagkanta niya ng "God Gave Me You" kay Meng... Wala pa rin makakapigil sa kilig! They even fed each other and almost touched each other. At one point, Maine almost choke that Alden had to give her a glass of water. Maine held his hands as he was making her drink some water. Fans’ shouts and giggles could be heard from the Broadway. Soon, Rihanna, the maid which is also played by Wally Bayola, came out to take the pictures of the two. The tandem took care not to touch each other, but Maine still could not look directly at him. After lunch, Alden get ready to leave. Before he went out, Maine gave him a letter addressed to his real name ‘Richard.’Yaya Dub was caught shouting ‘This must be love’. A few moments after Alden left, Lola Nidora shouted his name and the scene froze, leaving the viewers guessing what could have happened. The date coincides with the Pabebe Wave Day. The fans even made history once again with more than 20 million tweets using the hashtag #ALDubEBforLOVE.